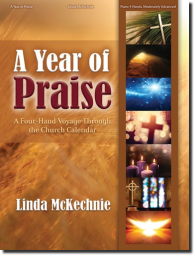 Linda McKechnie provides four-hand piano teams with beautiful and challenging hymn arrangements that highlight major events in the church calendar. She demonstrates her trademark of blending beloved hymns with favorite classics, incorporating timeless themes from Bach, Handel, and Faure in some of the selections. "A Year of Praise" is a superb addition to a skilled pianist's repertoire.